Shoulder pain can affect anyone and make normal day-to-day activities such as washing your hair or even sleeping painful and uncomfortable. Shoulder pain can be the result of falls and injuries, or from overuse. Age also increases the risk of developing shoulder pain due to accumulated wear and tear. What can cause Shoulder pain? Shoulder sprains such as rotator cuff injuries generally cause a deep, dull ache in the shoulder and are caused by tearing of tendons and ligaments. If the tear is severe, surgery may be required but in many cases the problem is repeated minor tears that result in a build-up of scar tissue. Painters, carpenters, weightlifters, swimmers, footballers, baseball and tennis players tend to be prone to rotator cuff tears. Falling on your shoulder or using your arm to break your fall can also cause rotator cuff injuries. Pain is often sharp in the front of the shoulder, hurting when the arm is lifted to 90 degrees or more to the side, or externally rotated. Bursitis occurs when the small fluid filled sacs in your shoulder joint become inflamed. Bursa are designed to prevent friction between bones, tendons and muscles in your shoulder joint. Bursitis is more common in the elderly but can affect anyone who overuses their shoulder joint. Shoulder pain caused by bursitis tends to come on gradually over weeks and even months and usually causes pain on the outside of the shoulder that can refer to your elbow, arm and wrist. The shoulder pain of bursitis can make it difficult to wash your hair, hang out washing or reach up into high cupboards. Thoracic outlet syndrome causes shoulder pain by compressing the nerves or blood vessels between your collar bone and your first rib, or under tight muscles of the neck or front of the shoulder. It causes neck as well as shoulder pain and often numbness and tingling in the outer three fingers. It can occur during pregnancy and poor posture such as being slumped or hunched for long periods at a desk increases your risk. Trauma and weightlifting can also cause the shoulder pain of thoracic outlet syndrome. The exact cause of frozen shoulder is a bit of a medical mystery but the shoulder pain and stiffness tend to worsen over time and can take as long as one to three years to resolve completely. Frozen shoulder causes pain and stiffness that can severely impact upon day to day life making it difficult to put on your sit belt, undo and do up bras, tuck your shirt into the back of your pants, throw balls or any activity or movement that involves lifting your arm above shoulder height. The inflammation of arthritis damages the cartilage of the affected shoulder causing shoulder and neck pain as well as stiffness and limited movement of the shoulder joint. Injury, age, certain occupations and sports that result in wear and tear of the shoulder joint increase the risk of developing arthritis in the shoulder joints. How can massage and myotherapy help shoulder pain? Myotherapy and massage can be extremely effective at providing fast relief from shoulder pain. Techniques such as myofascial release can help to loosen the layer of connective tissue that surrounds muscles and muscle fibres, helping to increase the range of movement. Trigger point therapy and deep tissue massage can help to break down old scar tissue and increase blood flow to the muscles, tendons and ligaments. Increasing blood flow brings in immune cells and nutrients. It also stimulates the lymph to carry away waste products, which helps to reduce pain and inflammation and encourage the body’s natural healing response. Prevention is always better than cure, so if you’re in a high-risk occupation or play contact sports, a regular massage can help to prevent shoulder pain from becoming a problem, by keeping your muscles supple and preventing postural dysfunction that can cause shoulder issues. 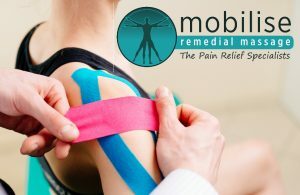 If you’d like more information on how massage therapy can help with your shoulder pain, contact the pain relief specialists at Mobilise Remedial Massage and they can help guide you on the most effective type of massage therapy for you. Need help with shoulder pain? Contact Mobilise Remedial Massage today.